Go into any souvenir store on a touristy Chicago street and behold the man: Al Capone. His visage will adorn T-shirts, refrigerator magnets, coffee cups and countless tacky tchotchkes people buy to commemorate their visit to the city where the world’s most famous gangster made his name. Even worse: Go into enough Chicago-area restaurants or bars, and it may surprise you how many are decorated with framed pictures of the ruthless killer grinning beneath his famed white fedora. The life story of Al Capone is unrivaled in Chicago history, and perhaps American history. How did an ill-educated bouncer from Brooklyn become not just a powerful crime boss -- many such crime bosses have come and gone -- but one who fascinates us generation after generation? Deirdre Bair’s new book, “Al Capone: His Life, Legacy, and Legend,” is the latest volume to attempt to answer this question. Bair, who won a National Book Award for her 1981 biography of Samuel Beckett, is a brilliant and engaging writer, able to construct compelling and nuanced life stories in gripping prose. Her latest book distinguishes itself from its competitors due to her access to descendants of Capone’s large family. Their memories and family stories are being added for the first time to the Capone narrative. Bair sets out to answer some of the fundamental contradictions Capone poses. Indeed he was. A few more complexities might be offered up front: Capone was a self-serving mythmaker, one whose willingness to talk to reporters (until they turned against him) helped fuel what might be called a bootleg version of history. Relatively few stories about Capone’s public or private life can be entirely verified, and so writers from his day to ours have had to grapple with myriad sources, to weigh them one against another, and to proceed with caution. The addition of Capone’s family stories to the mix has tremendous potential to deepen our understanding of the man as an individual human being. But it inevitably runs the risk of adding another unverifiable ingredient to the already bubbling caldron of legend. Not just more myths, either, but myths from people who can fairly be considered as biased toward a primarily positive understanding of Capone, as his foes (and victims) would be toward a wholly negative one. 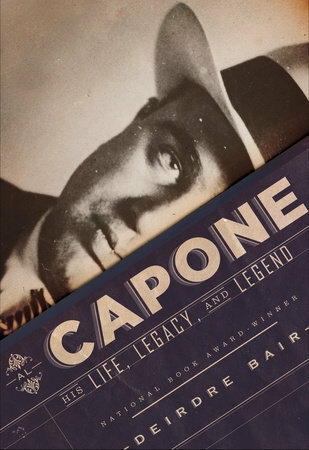 Bair’s subtitle -- “Life, Legacy, and Legend” -- suggests that she will attempt to untangle the biography, address what Capone left behind and investigate the mythology surrounding the man. In the end, however, Bair’s book does not live up to this promise. Her focus on Capone’s family life, marginalizing details of his criminal endeavors, is unbalanced.